( 90 years old Dargah Sharif ). Famous Dargah Shareef in Shimla where Hindus, Muslims, Sikhs all climb the steps- together to reach the ninety years old Hazrat Baba Srotri Dargah Shareef. Located at Ghora chowki, near Shimla in Himachal Pradesh, it is a place where religious differences become meaningless. One thing in this dargah shareef the mannat are fullfilled. and people from all faiths climb the steps to do ziyarat. Hazrat Makhdum Sheikh Sharfuddin Yahya Maneri popularly known as Hazrat Makhdum-ul Mulk Bihari or Makhdum-e-Jahan for his spiritual status One of the most Prominent Sufi Saint. His father Makhdoom Yahya Maneri was a great Sufi saint of Maner in Patna district. His maternal grandfather Makhdoom Shahabuddin Pir Jagjot was also a revered Sufi, whose tomb is located at Kachchi Dargah near Fatuha in Patna district. Born on September 16, 724 A.H at Maner, Sheikh Sharfuddîn was the son of Makhdoom Yahya Maneri bin Taj Faqeeh from Al-Khaleel (Palestine). His birthplace is Maner Sharif or Maner, a village near Patna in Bihar. In his early childhood, love for knowledge, religious life, and signs of spiritual greatness, were found. at the age of 12, He left Maner to gain traditional knowledge of Arabic, Persian, logic, philosophy and religion under Ashraf-ud-dîn Abu Towama(a famous professor) Bokharaei in Sonargaon near Narainganj now in Dhaka, Bangladesh where he spent 24 years in his company. At first he refused to marry, but when being ill, he was advised by the physician to take to marriage as the remedy for his disease. He married his teacher’s daughter BiBi Badaam. He left home after the birth of a son, named Zakiuddin in 1289 who lived and died in Bengal. After completing his education he left for Delhi where he met with Hazrat Nizamuddin and a number of other Sufis. there he became a disciple of Sheikh Najeebuddin Firdausi of Nerauli and got the title of Firdausi. To shun material comforts, Sheikh Yahya went into the forest of Bihiya(about 15 miles west of Maner). He later went on to Rajgir (about 75 miles east of Maner) where he chose to do ascetic exercises in the hills. A hot spring, near to a place where he often prayed in Rajgir, is named Mukhdoom Kund, to perpetuate his memory. At least 30 years in the forests, Sheikh Sharfuddin finally settled at Bihar Sharif. Later Sultan Muhammad Tughlaq had a Khanqah built for him where he taught and trained disciples in Sufism – tasawwuf. Information on this Dargah is being sought! If you can provide data on this Dargah please contact us. Your input will be greatly appreciated..Thank You! HAZRAT ALLAUDDIN KAAZAN SHATTARI ALSO KNOWN AS HAZRAT SHAIKH MOHAMMED ULAA (R.A) ( KHALIFA-E-HAZRAT PEER ABDULLAH SHATTARI (RA), THE FOUNDER OF SILSALA-E-SHATTARI ( ALSO KNOWN SHUTTARI SILSILA ) IN INDIA. Khilafat from Hazrat Abdullah Shattari (RA) was passed on to Hazrat Allauddin Kaazan Shattari (RA) also known as Hazrat Shaikh Mohammed Ulaa (RA) (d.1495) (11th shawwal 901 hijri) After receiving Khilafat he worked on his own spirituality, attained enlightenment and spent rest of his life in propagating spiritual Sufi messages in Shattari way. He lived in Muzzafarpur, a small town in southern Bihar – India. Shrine of Hazrat Allauddin Kaazan Shattari is located on a small hill in a small town near vaishali gadh, Hazipur Bihar. India. Near to his shrine we can find shrine of his eldest son Makhdoom Mansoor Halaaj Shaheed. Hazrat Abul Fatah Hidayatullah Sarmast (RA) was third son of Hazrat Allauddin Kaazan Shattari and Khilafat was further Passed on to Hazrat Abul Fatah Hidayatullah Sarmast (d 1538) (12th Shawwal 944 hijri). 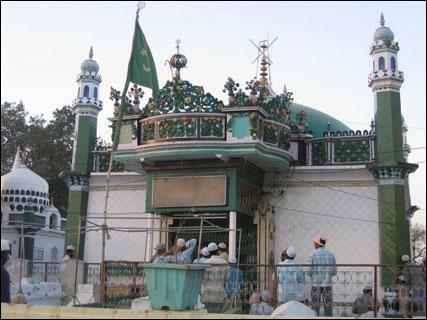 The Dargah Shareef of Hazrat Abul Fatah Hidayatullah Sarmast (RA) is located in a small village near Vaishali, Hajipur, around 20 kilometers from Patna – Bihar. India. This Village is situated on the banks of Ganga River. Famous Mughal king Humayun was a dedicated follower of Hazrat Abul Fatah Hidayatullah Sarmast and took his advice on worldly, political and spiritual issues. STATE : Bihar , India. Hazrat Abul Fatah Hidayatullah Sarmast (RA) gave Khilafat to Hazrat Shah Zahoor Haji Huzoor The Dargah Shareef of Hazrath Shah Zahoor Haji Huzoor (RA) is located Malikana kabrastan, Ratan Sarai (Railway Station), Sivani, Bihar. India. It is believed that he adopted two children named Shaikh Fariduddin Jahangir and Shaikh Khatiruddin. These children are known in history as Shaikh Behlul Fatah and Hazrat Shaikh Mohammed Gouse Gwaliori respectively. 4) Hazrat Shah Zahoor Haji Huzoor Shattari(RA), Malikana kabrastan, Ratan Sarai Ratan Sarai ( Railway Station ), Sivani, Bihar. In Bangalore a very Famous Dargah Shareef of Sufi Saint belonging to Silsala-e-Shuttaria is of Hazrath Attah-ulla shah Shuttari (RA), who is very well known as the peer-o-murshid of Hazrat Hyder Ali Khan Bahadur (RA) father of Hazrat Tippu Sultan Shaheed (RA). Makhdoom Yahya Maneri : Hazarat Makhdoom Yahya Maneri was a famous Indian Sufi saint of 13th century. His tomb lies in a Masjid, located in Maner, 29 Km from Patna, Bihar, India. The sacred shrine is locally known as Bari (meaning big) and Choti (meaning small) Dargah. Like several other shrines of Sufi saints, Hazarat Makhdoom Yahya Maneri is revered both by Muslims as well as by Hindus. This shrine has remained a place of pilgrimage since very old time, and Sikandar Lodi and the Mughal emperor Babar (1520-1530) had also visited the shrine. This is the most secred Muslim shrine in Bihar. In the present fort area the oldest building inside the fort is a sacred Muhammdan shrine built on an elevated piece of ground near the southern gate. It is said that it was a mazar of a Pir or Saint whose name is still unknown. He is said to have traveled from Persia to Ajmer and from there came down to Munger under the instructions from Khwaza Moin-Uddin Chisti- the famous Sufi Saint and Lived at Munger for many years and also died here in 596 A.H, corresponding to 1177 A.D. He was buried in an obscure place near the ramparts and with the lapse of years exact burial place was forgotten. Ultimately, in 1497 A.D. when the ramparts of the fort being repaired by the Governor, Prince Danyal. It was he who ordered a mosque to be built over that place. So since 1497 the particular place has been known as the Dargah of Shah Nafah, nafah being a Persian word meaning ‘pod of musk.’ Over the gateway there is an inscription set up by Prince Danyal and a round the Shrine are many old tombs in a delapitated state. There is a popular tradition that Prince danyal got a divine dream about the exact location of the Dargah of Shah Nafah. A hint was given to him that the Dargah existed where the earth gave out the fragrance of Nafah (Kasturi). It is significant to note that the Dargah attracts not only the Muslims but also the Hindus of the town. The offering of Chaddar and holding a musicial programme has become an annual feature on 1st of January every year. The dargah is said to be the protector of the town and a place of wish fulfillments. All those who pass through the road bow their heads in remembrance of the of the Great Saint. The Bihari Sufis, who belonged to the Wajudia School, believed that ‘Everything is He (Hama Oast) ‘and reconciled religion with philosophy. Some of the early Bihari Muslims, as Sheikh Aaz of Karo (Gaya) and Ahmad Bihari, held views for which they were ordered for confinement and punished with chains. According to H. Shuaiv, Sultan Firuz Shah Tughluq at the instance of the orthodox Ulema of Delhi put the saint of Sheikhpura, Sheikh Aaz and Ahmad Bihari to death. Researches have revealed that Sufism had reached Bihar and its neighbouring regions even before the Turkish conquest. Its earliest adherents belonged to the Chisty and Soharwardia order of the Sufis. Some of the well-known representatives of the Chisty order were Hazrat Mohammed Shahab-ud-din (RA) or ‘Pir Jagjot’ of Jethuli, Hazrat Badr-e-Alam of Choti Dargah, Hazrat Mir Fazlullah Gosain of Daira, Hazrat Farid-ud-din Tawaila Bux of Chandpura, Hazrat Ahmad Isa Taj of Bhaisaur, Hazrat Ataullah Baqhdadi of Mir Dad and Hazrat Syed Sadr-ud-din Zahidi (RA) – all belonging to the town of Biharsharif (Nalanda). Saran, another notable center of activity of the Chisty Sufis, acquired considerable fame for its association with such scholarly saints as HazratMir Zahi Madariad Sarani of Sepaha, Hazrat Abdul Malik of Ushri and Hazrat Mohammed Syed Hasan of Hasanpura. Though the Shuttaria orders have now sunk into oblivion, there was a time when they had a great hold on the people of Bihar. Hazrat Syed Jamal-ud-din Madar of Makanpur (Uttar Pradesh) who had come over to Bihar was a well-known representative of the Madaria order. His mausoleum at Hilsa contains a dated inscription. One of the greatest Sufis of the Shuttaria order was Hazrat Abul Faiz Qazin Ola of Bania Basarh, near Vaishali. The Qadri order is said to be “now one of the chief Sufi order of this province. We had one of its best representatives, Hazrat Sayed Muhammad of Amjhar Sarif in the Aurangabad district”. The most important of all the Sufi orders in Bihar, however, was the Soharwardia, especially its sub-section, the Firdausia Silsila, one of whose most celebrated saints was Hazrat Sharf-ud-din Ahmad, who was born at Maner in 1262 and died at Biharsharif in 1377. The Mosques and Khankahs of the Sufi saints and preachers soon became centers of learning and veritable madarsas. Saif Khan’s mosque and madarsa with its many saintly scholars on its staff, flourished till the end of the eighteenth century. The mosque of Hazrat Ataullah Zasinabi at Phulwari, bearing an inscription of Akbar’s time, still stands and the madarsa still continues. Mulla Abul Husan of Darbhanga, the saintly scholar who taught Princess Zebunnisa, the accomplished daughter of Emperor Aurangzeb, and the five scholarly members of the syndicate that compiled Fatwa-i-Alamgiri, were all great saints of their time. It is a large village of historical antiquities, situated in the extreme northwest of Danapur Sub-division, about 32-kms west of Patna on Patna-Arrah Highway. In the early ages Maner was a center of learning and it is said that grammarian Panini, and also Bararuchi, lived and studied here. Maner contains two well-known Mohammedan tombs, that of Hazrat Shah Daulat or Makhdum Daulat, known as the Chhoti Dargah, and the other that of Hazrat Sheikh Yahia Maneri or Makhdum Yahia, called the Bari Dargah. Hazrat Makhdum Daulat died at Maner in 1608, and Ibrahim Khan, Governor of Bihar and one of the saint’s disciples completed the erection of his mausoleum in 1616. The building is exceptionally fine one, with walls containing carvings of great delicacy and high finish. It stands on a raised platform, and at each corner rises a slender tower of graceful proportions. A great dome crowns it, and the ceiling is covered with carved inscriptions from the Quran. Every detail of it is characteristic of the architecture of Jehangir’s reign, and it is by far the finest monument of the Mughals in Eastern India. Inside the compound there is a mosque also built by Ibrahim Khan in 1619, while a fine gateway bearing an older inscription corresponding to 1603-01, affords access to the north. The tomb of Hazrat Yahia Maneri (RA) lies in a mosque to the east of a large tank, with masonry walls and ghats, and pillared porticos jutting out into it, which is connected with the old bed of the River Sone by a tunnel 400-ft long. Nearly 7 kms from Patna junction Railway Station, Phulwari Sharif is an important Islamic pilgrimage. It has been always a favorite abode of Sufi saints in various times. Hazrat Pir Muzibullah Qadri (RA) was on of those in the 18th Century. The Khankah Muzibia founded by him at Phulwari Sharif is called the Bari Khankah. An old Madarsa here has been the most important center for teaching of Islamic philosophy since its establishment. There is also an archaeologically important and worth seeing ancient Sangi Masjid (mosque) built of red stones at Phulwari Sharif. The Mughal Emperor Humayun built it. Sacred hairs of the beard of Paigamber Hazrat Muhammad Saheb is preserved here in the Bari Khankah that attracts throngs of his followers and a big mela is held every year. This is headquarters of Nalanda district that lays 30-kms south of Bakhtiarpur on NH-31. This is also a railhead on the Bakhtiarpur- Rajgir branch line of the eastern Indian Railway. This town is known as Biharsharif, owing to its many Muslim tombs that still retain traces of its former importance as a Muslim pilgrimage. There is a hill called Pir Pahari, about 1-km to the northwest of the town. At its summit is the dargah or mausoleum of the Saint Hazrat Mallik Ibrahim Bayu, round which are tem smaller tombs. It is a brick structure surmounted by a dome and bears inscriptions showing that the saint died in 1353. Another great dargah is that of Hazrat Makhdum Shah Sharif-ud-din, also called Makhdum- ul -Mulk, who died here in 1379; the inscription over the entrance shows that his tomb was built in 1569. This tomb, which stands on the south bank of the river, is held in great veneration by the local Mohammedans, who assemble here on the 5th day of Sawan to celebrate the anniversary of his death.The Chhoti Dargah is the shrine of Hazrat Badruddin Badr-I-Alam, famous saint who died here in 1440. This is a Muslim pilgrimage, some 26-kms from the Sitamarhi town. The place is treated to be very sacred after Bihar Sharif and Phulwari Sharif. One of the offsprings in the family of prominent Sufi Saint Hazrat Pir Muzibullah Qadri (RA) had founded another Khankah during 19th Century near a tank called Mangal Talab that is situated in the Patna City Chowk area. It is called Khankah Emadia that houses a Madarsa. An Urs is held here annually when throngs of devotees assemble and pay their respect to their beloved Sufi Saint. Mausoleum of a Muslim saint, named Hazrat Maulana Samarkandi Rahamtullah Alaih is situated about one and half kilometers east of mohallah Mishra Tola and on the westerly south corner of a tank known as Sukhi Dighi, south of the Darbhanga railway station. It is said that the saint had demonstrated miracles on many occasions and had helped people overcome their problems. It is said that the saint hand established here a Khankah about 132 years back. The annual Urs of the saint is held here in the month of July. Women are not allowed to participate in the Urs. A beautiful double storied mosque was built by Mugal Prince Azim on the banks of the Ganges at Mittan Ghat in Patna City area that was previously called Azimabad during the reign of Mugal Emperor Aurangzeb. This mosque was built for Mulla Mittan who was teacher of the Prince. It was the place from where the great Sufi Saint Hazrat Makhdum Muneem used to preach his disciples during the 18th Century. The ancient mosque still exists and is popularly known as Dargah Sharif. Every year, after five days of the “Id” festival, an annual Urs Chiraga is held here when devotees assemble at this Dargah Sharif in great numbers. Amjharsharif is an important Islamic pilgrimage in the Aurangabad district. It is about 10 kiometers from Panchrukhia on the Daudnagar – Gaya Road ( about 100 kms from Patna) under Haspura Police Station. There is an ancient Mazar (Grave) of a Muslim saint Hazrat Saiyadana Mohammad Jilani Amjhari Quadri. His Urs Mubaraq (Anniversary) is celebrated here in the first week of Rabi Allab (June) every year. Thousands of Muslim pilgrims visit this place from all over India on this auspicious occasion. Holy Hairs of the Saint, which is still preserved here, are put on Holy Display during the Annual Urs. The village is situated about 24-kms north of Siwan and has apparently derived its name from a Muslim tomb that it contains. The tomb is that of a Mohammedan saint named Hazrat Shah Arzan who hailed from Patna. It is said he was attracted by the solitude of the place and had performed a chilla or a religious contemplation of 40 days. He also set up a religious establishment, which was endowed by the Emperor Aurangazeb. The anniversary of the saint’s death is celebrated on the 11th of Rabi-us-sani every year, which attracts a large crowd. The famous Dargah of the great Saint Shah Zahoor Ali Warsi (of 19th Century) is situated in Bazidpur village under Nawada district. Special feature of this historical Dargah is it’s strong following both among Muslims and Hindus.A colourful congregation is witnessed on the occasion of annual “Urs-e-Mubarak” which is held on the 28th day of ‘Iddul Azha’ according to Islamic calendar. This celebration is now carried on by the fifth generation of the great saint ” Shah Zahoor Ali Warsi”. The biggest and the oldest building of Mohalla-Amber in the Biharsharif town (Nalanda), is Tomb of Hazarat Makhdum Sultan Saiyad Shah Ahmed Charampose Teg Barhana Rahmatulla Alaih. He was born in the year 1236 and passed away in 1335 (according to Islamic calendar 657 – 776 Hizri). He is ranked to a very high order among other Sufi saints and Auliahs. Many stories about the Saint are prevalent among people even today. According to one such story, the Saint was once on a visit to Tibbet. The Ruler and people of that state, for their misconceptions, tried to inflict harm on him. The saint, for his self-defense, just raised one of his fingers and heads of those mischievous people instantaneously fell off their bodies. After this incident, adjective of “Tang Barhana” (A Sword out of the Sheath) was added to the Saint’s name. Another adjective of “Charampose” is added to his name for that, he always wore skin of a Dumba (specie different from ordinary goat), which was offered to him by Hazrat Hussain Pyare, his chief disciple.Thousands and thousand of people participate in the “Urs” celebrated here in memory of the Saint every year. Another great dargah at Biharsharif is that of Makhdum Shah Sharif-ud-din, also called Makhdum- ul -Mulk, who died here in 1379. An inscription over entrance of the dargah shows that his tomb was built in 1569. It stands on the south bank of the river and is held in a great veneration by the local Mohammedans, who assemble here on the 5th day of Sawan to celebrate anniversary of his death. The village, which is situated 5-kms east of Jagdishpur, has a 300 years old grave of a Muslim saint Masar Dewan. It is held as sacred by the Muslims. Shaistha Khan, the maternal uncle of Aurangzeb, erected a tomb known as Mamu Bhagana ki Kabar. It is situated near the pond of Shivai Singh in the mouza of Jarwa. Taj Khan built the tomb of Makhdum Shah Abul Fateh Sheikh Shuttari in mouza Tangaul. The tomb of Bar Khurdar Aulia Shaheb is near Hatsarganj police outpost. In Mohalla Khatte Ruknuddin there are two tombs, one of Hafiz Barkhurdar and to the east of it is the tomb of his disciple Ruknuddin Shaheb. The tomb of Hazrat Maohiuddin alias Pir Damaria Shaheb is in Minapur, which is built of marble. Other tombs of Kamaluddin Shaheb and Khaja Mohiuddin Chisti, disciple of Baba Fariduddin Gunj Shakar Multani are also here. Emperor Jahangir built the tomb of Syed Haji, son of Syed Dost Muhammad. The tomb of Hazrat Jalaluddin Abdul is to the east of Nepali temple. The tomb of Khwaja Bhil is on mouza Chakbhil near Bagmati. He was also a disciple of Baba Gunj Shakar. The grave of a revered Muslim Saint is still pointed out at Hazrat Jandaha, 32 kms east of Hajipur and about 14 kms north of Mahnar village in the Hajipur sub-division of the Vaishali district. The Saint gave this name to the place and the river that flows past it, was known as Diwan Sah Ali. It is said that one hot summer day he felt very thirsty, and asked a by-stander to fetch him some water. The man was rude enough to reply that there was no water to be had close by. At this the Shah got very angry, and in his anger called on the water to flow that way, saying ‘ Biah ‘ (Persian– ‘ Come ‘). Immediately a river began to approach the place, cutting away intervening land and causing devastation and ruin to the villages as it advanced. This so terrified the neighbouring people that they came in a body and implored the Shah to have pity on them and cause the river to spare their lands. He then called out Jandah (do not drown) and the river stopped encroaching and began to flow quietly in its present channel. Thus the river was called Baya and the town Jandaha. This Diwan Sah Ali was himself the subject of miracle, performed on him in his infancy by his uncle, who was equally remarkable and he lived in Hajipur where his tomb is still pointed out. His name was Makhdum Shah Abdul Fatah. It is said that, on one occasion, during one of his fits of ecstasy, which lasted for long periods, he threw his nephew Shah Ali who was only six days old into the river Gandak calling on the river saint Khwaja Khizr to educate him and take care of him. After six years, when he had recovered his mother told him what he had done and what a grievous injury he had caused to his brother and sister-in-law, who had never ceased bewailing the loss of their only child. Thereupon Makhdum Shah told her not to grieve, and going to the river said–” Khawaja Khizr, give me back my nephew, whom I committed to your care six years ago. ” On this, the river began to roll and out came the boy, roved and jeweled like prince. Though young, he was thoroughly conversant with all the religious laws, and afterwards became the famous Hazrat Shah Ali from whom Hazrat Jandaha got its name. There is a mosque situated a few steps away from the river appertaining to the 15th Century. Kanti is an important and progressive village about 15 kms from Muzaffarpur to the west on the road between Motipur and Muzaffarpur. It is situated on a Man (water channel). There is a Mazarof a Muslim saint, which draws a large crowd throughout the year. A village in the Sadar subdivision 40 kms northeast of Chapra and 25 kms north of Manjhi. It contains extensive ancient remains now covered for the most part by cultivated fields. There is an abrupt rise at Makdum Shah’s dargah, a little south of Harpur, which continues for a couple of miles south till it terminates somewhat more abruptly beyond Khwaja Pir’s Mazar. On the east of this elevated site suns a stream known locally by two names, Gandaki and Saryu. This is well defined and may have been a channel made in ancient days for water supply. West of this and parallel to it, the high ground extends for an average width of not less than about half a kilometer. On approaching the southern end a pile near a mound is observed, on which are the remains of a brick building. It is learnt that this pile is the Ganj-i-Shahi-dan or martyr’s heap near the traditional Rajas’s kot. This indicates a desperate assault at some time on a Hindu stronghold. Further on, there are Khwaja Pir’s Mazar, and two tombs on an open enclosure. The village is situated about 21-kms south of Siwan on the Bank of Dhanai River. According to tradition, Makdum Saiyed Hasan Chisti, a saint who came from Arabia to India and settled here, founded this village. He also founded a Khankah (religious institution) here. The village contains remains of a large mosque and tomb of the Saint, which is visited by both Hindus and Muslims. The grave is a large open court to the west of the village. About 4 kms from Muzaffarpur there is a mausoleum of Hazrat Data Kambal Shah Rahamtullah Alaih who was a Muslim saint. It is said that he did hold position of a Qutab in the Muzaffarpur city in his times. Many stories of his miracles are prevalent in the society. The annual Urs of the saint is held here every year after the 7th day of the “Id” festival that continues for next 6 days. Thousands of devotees from every nook and corner of country come here to participate in the said Urs. The village is the headquarters of the block of the same name and is situated on the Jehanabad-Biharsharif road, about 10-kms east of Jehanabad railway station. According to a local legend, Ram Chandra’s stepmother, Rani Kaikeyi of Ayodhya lived here for sometime and the village took its name after her. The village has also a Mazar of Hazrat Bibi Kamaal Sahiba, a great Muslim lady saint. It is said that this lady was the aunt of Hazrat Makhdum Saheb of Biharsharif and possessed divine powers. Panhessa is a village on Biharsharif – Rajgir road in the Nalanda district. This village was abode of Maulana Abul Mohasin Mohammad Sajjad who was a great religious scholar of Islamic pantheon. He was the founder of the Emarat-e-Sharia, Phulwarishariff that has the highest order among the Muslim’s institution. Ahmad Sajjad was elder brother of the Maulana. He also was a great Sufi saint of his times. He was a very popular saint and the people had deep regards for him. Stories of the saint’s miracles are still prevalent among natives of the village. His Mazar is located near a mosque in the village where Urs of the great Sufi Saint is celebrated every year on the 27th day of Muharram. Considerably large numbers of Muslims, as well as, Hindu devotees participate in the Urs. The great mausoleum of Sher Shah is situated in the western outskirts of the town in the center of a large excavated tank or lake. This beautiful and impressive structure was built towards the middle of the 16th century. Hexagonal in shape and built of stone, it is the second highest tomb in India. It is a fine specimen of Pathan architecture that catches eyes of tourists at the very first glance. The old tomb of Hassan Khan Sur, father of Sher Shah is also known as Sukha Rauza. It is situated in the heart of the Sasaram town. This tomb contains inside its courtyard, a small mosque and a madarsa or school. Outside the compound wall on the western side there is a large stepped well with stone ghats on its southern and eastern sides, covered galleries on the north and west and a large well in its center. This is situated on the summit of the hill, hardly 30 feet to the east of the above cave. There is also an old mosque at the foot of the hill that contains an inscription referring to its construction during the reign of Jehangir in 1613 A.D.
About 5-kms east of the town is a hill called Pir Pahar, from the top of which a fine view of the surrounding country is obtained. The hill is called after an old Mohammedan saint or Pir. There are two old tombs side by side at the foot of the hill, on one of which there is an inscription to the memory of one Mary Anne Beckett, who died in 1832, while the other has a damaged inscription showing, till a few years ago, that it is in memory of a person named D’Oyly; the portion containing the name has now disappeared. This is situated on the top of the bastion at the southwest angle of the fort. The Mulla was a Persian poet and had come to India from Mazandran near the Caspian Sea, during the reign of the Emperor Aurangazeb, who employed him as a tutor to his daughter Zibunnisa Begum. The Mulla died in 1704 A.D. and his tomb existed till the early years of this century, when it was demolished and the grave removed. The building is raised inside the southern gate of the fort on the top of a small mound, about 25′ high. The building of the tomb consists of a domed tomb chamber with a prayer room or mosque and a rest room attached to it. A few carved stones are to be seen embedded in the low platform to the south of the tomb, and disfigured with unsightly holes or depressions made by those who believed in their efficacy to cure certain diseases of children. Gadh of Pir Saheb is situated 13 kms North from headquarters of the Supaul block and 4 kms South of headquarters of the Kishunpur block. This gadh is spread over an area of about 60 acres. There is a block of stone, which is said to be gradually increasing in shape and size and has become larger than the earlier. This stone has now interestingly become a sacred object. It is said that one can easily lift it up if he has a deep regard for it, on the contrary he cannot do so if he has even a little bit of disregard for the same. As said, earlier some thieves tried to steal away this stone but could not do so. They had to abandon the stone before they get out of the periphery, as they turned blind and the stone itself came back to it’s original position. By road Connected by good roads with all Indian cities. Tariff range: Rs. 75/- for Dormitory bed and Rs.600/- for Double bedded room. Other private Hotels, Rest houses and Dharmshalas are also available at Hajipur and Muzaffarpur. Hired taxis / buses from Hajipur and Muzaffarpur. Several Khanqahs are located in India, particularly in the state of Bihar. Among all the Khanqahs, Khanqah Emadia Qalandaria is unique. It is located at Mangal Talab (Previously known as Mangle’s Tank), Patna City. For centuries it is specifically engaged in sincere public service by helping the society in their social and spiritual matters. It is distinct in many ways. There were great theologians, learned men, poets, literary persons and renowned physicians in the Khanqah, established by the saint Hazrat Khwaja Emaduddin Qalandar who was affectionately called “King” by his disciples. At present it is Al-Haaj Hazrat Maulana Syed Shah Misbahul Haque Emadi who is responsible for rendering the social, theological and spiritual needs of the present society in continuation of the noble works his elders did in the past. He is an emblem of knowledge and dedication in line with his ancestors. He is the Xth Sajjada Nasheen of this Khanqah and admirably performing the work of public service and guidance to society. All Sajjada Nasheen of this Khanqah, besides giving importance to the main aim of serving the cause of Islam gave priority to foster amity and brotherhood among all communities and were always ready for the service to humanity. They wrote simple but appealing books in prose and also created exemplary poetry highlighting national integrity, universal brotherhood and promote the desired relationship between the one and only creator with His creations. Hazrat Khwaja Emaduddin Qalandar after gaining spiritual training from Hazrat Fazil Qalandar who lived in Sadhor, located in Haryana, came back in 1104 A.H to Phulwari Shareef which was his ancestral place for the last 200 years and started the work of teaching and preaching spiritualism. His father Hazrat Burhanuddin Qadri Rahmatullah Alaih preferred seclusion to spend more time in his meditation. He bestowed upon Hazrat Emad all the responsibilities of his Khanqah after imparting him with all the necessary theological knowledge and spiritual training. Hazrat Emad was also blessed with the Khilafat of his father’s Silsila (Silsila-E-Junaidia). Hazrat Khwaja Emaduddin Qalandar besides giving importance to the study of Islam took deep interest in the establishment of a better society. Keeping this view in his mind he wrote a booklet, first of its kind in Urdu at the meager age of 13 or 14, called “Seraat-E-Mustaqeem Al-maroof Seedha Raasta” (Straight Path) which primarily caters to the welfare of women. This work is considered the pioneer work of Urdu Language in Bihar. Hazrat was very fond of acquiring books and took it as a mission to make his father’s library as a great personal treasure-house to be used by his family members and disciples. This library has since been a matter of great personal pride for each Sajjada Nasheen of Khanqah Emadia. The present Sajjada is its whole and sole owner. It has almost 1000 valuable texts. Most of them are hand written manuscripts of religious scholars of this Khanqah and some are written by other Sufis (saints). After returning to Phulwari Shareef Hazrat Qalandar started teaching in place of his father. The school called Darul-Uloom Emadia runs even today and students come to study here in large number. It is located in the premises of Khanqah and all expenditures of the students are borne by the Khanqah’s managing committee for this seminary. Hazrat Tajul Aarfeen Pir Mujeebullah Qadri Rahmatullah Alaih was the first, most beloved and close disciple of Hazrat Khwaja Emaduddin Qalandar. When Khwaja Qalandar died in 1124 A.H, his son Hazrat Syed Shah Ghulam Naqshband Sajjad became next Sajjada Nasheen to take his place. He was a classic poet of Urdu and Persian and also expert on matters of spirituality. He was a true saint. One of his verses can be presented as an example of the artistry which he had in combining the Urdu and its sister Hindi of that era. One by one two daughters of Hazrat Taaj-Al-Arfeen were married to Hazrat Sajjad. He had no male issue .He was father of two daughters. One of the daughters was married to Hazrat Noorul Haque Tapaan, son of Hazrat Abdul Haque, the elder grandson of Taaj-Al-Arfeen. When Hazrat Sajjad died in 1113A.H, his son-in-law Shah Noorul Haque Tapaan became the next Sajjada Nasheen of Khanqah Emadia. Who made me a martyr of astonishment by bringing me in the state of prostration? These verses depict not only the level of his contemplation; but also symbolize the aspects of national integration, communal harmony and religious tolerance. While Hazrat Tapaan was Sajjada Nasheen of Khanqah Emadia, his grandfather Hazrat Tajul Aarfeen died in 1191 A.H. Some people who were jealous of him started opposing him openly, even to the extent of causing physical and material harm. Hazrat had become old and weak. Due to his ill health; he gave away his seat in 1211 A.H. He made his son Hazrat Maulana Syed Shah Zahoorul Haque Zahoor Emadi (RA) the next Sajjada Nasheen. At this change the opposition and enmity became more intense. Hazrat Zahoor tried to minimize his interaction with the world outside Khanqah. Moreover his responsibilities had increased manifold after his becoming the Sajjada Nasheen. On the other hand an uncle of Hazrat Tapaan, Hazrat Shah Nematullah was the Sajjada Nasheen of Khanqah Mujeebia. Difficulties against the Khanqah were increasing. The trouble became so acute that Hazrat Zahoor left Phulwari shareef one fine morning along with his family including his father who was not keeping good health. They reached Patna city by night and stayed with Hazrat Shah Ambar who was a disciple of his grandfather Tajul Aarfeen. The mosque and grave of Shah Amber still exist at Jhao Ganj, Patna City. While leaving Phulwari shareef along with his family, Hazrat carried with him Moo-E-Mubarak (the blessed holy hair of the holy Prophet), some other valuable items of his ancestors and few books and manuscripts. After coming to Patna city, when Hazrat Zahoor went to Phulwari shareef the next day to bring his luggage and other commodities, he found that his house was burnt down along with the mosque, his Khanqah and his library. Many historical and valuable assets were lost in the fire. He returned back, taking with him a half-burnt robe and handkerchief of the founder of Khanqah, Hazrat Khwaja Emaduddin Qalandar. Some books that were not completely burnt were picked from the heap of ashes. These items are still present in Khanqah Emadia. After staying for few days in the house of Khwaja Amber, he shifted into the mausoleum of Mir Ashraf (presently in supervision of Archeological Survey Of India). Both father and son were so badly shaken by this departure from the ancestral place that Hazrat Tapaan fell ill and died within three years on 04th of Shabaan 1233 A.H. Just after few months on 16th Zeeqadah 1234 A.H. Hazrat Zahoor also died. He was the third Sajjada Nasheen of Khanqah Emadia. He holds a very high place among all descendents of Tajul Aarfeen and being an exemplary person with great talents that all those connected to him will always remain proud of him So far in this Emadia chain of luminaries, no one has been more qualified as regard knowledge, literary works, religious practice and preaching of theology and spirituality, devotion and dedication to the Almighty. It is said that he wrote more than one hundred books but unfortunately most of them have been lost. Only 31 of his books are present in Emadia library. Copies of his several books may be found in some important libraries in the country as well as outside the country. Hazrat Shah Abdul Aziz of Delhi who was an authority on Hadith, has acknowledged his knowledge of Hadith and issued a certificate to this effect. Hazrat Shah Zahoorul Haque memorized the Quraan and also was a hafiz of Sahihain i.e. Hadith Bukhari & Muslim Shareef (text as well as the chain of narration). After his death, his eldest son Hazrat Shah Naseerul Haque became next Sajjada of the Khanqah. He was very devotional and a pious man. He wrote many books which are available in the library. He died in 1260 A.H. He did not have a male issue. Therefore after his death his younger brother Syed Shah Ali Ameerul Haque became next Sajjada Nasheen. He was a kotwal posted at Allahabad. He had to resign from the job as is required to become a Sajjada Nasheen. He was a learned man. Because of his able leadership many improvements and developments took place in Khanqah. The present building of Khanqah is due to his endeavor. He purchased land and constructed the building. The whole building of Khanqah Emadia, inclusive of community hall, private chamber, residential portion and mosque were built not only under his personal supervision in a span of just two years but were actually designed and drafted by him. The upper story of residential portion fell down in the earthquake of 1934. The arch of the mosque was designed by Hazrat Shah Ameerul Haque himself. The chamber of Moo-E-Mubarak in red color was also designed and carved by him. He was very fond of construction work and adept at draftsmanship. This is amply reflected on the very first glance of the old building of Khanqah Emadia. He had such an expertise that in just 29 days he memorized the whole Quraan shareef. After living a long life Hazrat Ameerul Haque Rahmatullah Alaih died on 05th Moharram Al-Haraam 1302 AH. On his death, his son Hazrat Syed Shah Rasheedul Haque Emadi became the next Sajjada Nasheen. Hazrat Shah Rasheedul Haque was very handsome and a man of elegant personality. He used to visit regularly the graves of holy men. While going to perform the Hajj, he visited Iran, Iraq, and other pilgrimage centers located in Arabia. He returned back after two years. He had comprehensive knowledge of Quraan and wrote commentary on it but that could not be published. Unpublished work is preserved in Khanqah library. He recorded his experience during the journey in the form of a travelogue and entitled it “Rehlatul Rasheed Al Muqamaat Al Sayeed”, which is present in the library. He died in 1339 A.H. After his death, his son Hazrat Maulana Sayyed Shah Habibul Haque Emadi became VIIth Sajjada Nasheen of the Khanqah. He memorized the Quraan shareef and was very good at the art of calligraphy. The books written by him are fine specimen of beautiful handwriting. He was a good orator and preacher. He often took part in lively arguments with people belonging to Arya Samaj. Having a deep knowledge of Quraan-E-Kareem he used to lecture on its commentary at various places in the town. Once a week he used to teach in Khanqah, the commentary on Quraan and one day used to teach Masnavi of Maulana Rumi. He continued with the tradition of teaching students who came to learn the science of religion. Though there was shortage of residential space after the quake of 1934 but he continued his teaching classes. In September 1942, on 1st Ramadan 1361 AH, he died. After his death, his eldest son Hazrat Maulana Sayyed Shah Sabihul Haque Emadi became VIIIth Sajjada Nasheen of the Khanqah. He was VIIth descendent of Hazrat Tajul Aarfeen. He studied under Maulana Azad Subhani and acquired spiritual knowledge from his father Hazrat Sayyed Shah Habibul Haque Emadi Rahmatullah Alaih and Grandfather Sayyed Shah Rasheedul Haque Emadi Rahmatullah Alaih. Apart from being a good orator, he was a fine essayist. Features written by him were often broadcast from All India Radio and published in periodicals and journals. He wrote a biography of Hazrat Sheikh Sharafuddin Yahya Maneri Rahmatullah Alaih by the name of “Zikr-E-Sharaf”. He was a good poet and possessed melodious voice. He completed the writing of commentary on Quraan which was started by his father and also taught it in Khanqah. He used to teach Masnavi Maulana Rumi on every Sunday after the night prayer and explain its philosophy and deep meanings hidden in the simple verses. His Duaas (supplications) after the prayers were very eloquent, particularly at the end of Morning Prayer on the occasion of Shab-E-Barat and the last Friday of Ramadan (also known as Jummatul Widaa). He used to describe the events of Karbala on Xth of Moharram Al Haraam in a way that no body could control their tears. It is said that his father as well as his grandfather too used to pray similarly and crowds of hundreds and thousands of people used to weep profusely. When Hazrat Sayyed Shah Sabihul Haque Emadi Rahmatullah Alaih died on Friday at 1: 10 pm on 24th of Moharram Al Haraam 1395 AH which falls on February 7, 1975, his eldest son Hazrat Maulana Sayyed Shah Faridul Haque Emadi became the next Sajjada Nasheen of Khanqah. During his time the Khanqah acquired much more fame and many people became his disciple within the country as well as abroad. Hazrat Farid was a practical man, well behaved and had an exceptionally good moral character. He always remained on the side of truth and always remained firm with truth. He maintained a life according to religion. In order to promote religious knowledge, he re-established Madrasa Darul Uloom Emadia. It is a very prominent institution of its kind in Bihar. He renovated the damaged parts of the Khanqah, its adjacent buildings and the mosque just after becoming the Sajjada Nasheen. He built a dome over the chamber in which Moo-E-Mubarak is solemnly placed. This dome is a replica of Gumbad-E-Khizra. Its inside is decorated with shining tiles. The decorations of mosque that had turned stale were replaced by him with bright and new tiles. Building of the library had become dilapidated. He built a new hall of the library and repaired its almirahs. He even added eight more almirahs of steel. He increased the number of items in the library and established a publication centre by the name of Adara-e-Rasheedia in the memory of his grandfather Hazrat Syed Shah Rasheedul Haque Emadi Rahmatullah Alaih. Many of his writings were published at this centre. He was always ready for the public service and always represented the Khanqah in such endeavors. He died on March 17, 2001. On his death, his eldest son Hazrat Maulana Syed Shah Misbahul Haque Emadi became Sajjada Nasheen of the Khanqah. Hazrat Khawaja Abdul Karim Chishti Rehmatullah Alaih well Known as Sarkar BaBa Huzur. “HAZRAT SAYYED GHAZI NOORUDDIN IRAQI” he aur aapka Laqab “NAHAR SHAH WALI HE.” Aapka laqab NAHAR SHAH isliye he kyunki aapke sath humesha ek sher (Lion) rehta tha jo aapke baithne ki jagah ko apni poonch se saaf kiya karta tha aur aapke inteqaal ke baad musalsal kai saal tak woh aapke mazaar-e-mubarak par aakar aapki chokhat ko apni poonch (Tell) se saaf kiya karta tha isi liye Hazrat ko Nahar Shah Wali Kaha Jata he. VARSI DARGAH. This DARGAH is in Shajapur. This DARGAH is known as “SAYED HAJI HAJRAT SHAH KI DARGAH”. On the occassion of RANGPANCHMI peoples organise MELA and URSA here. Shajapur is a town in Malwa region of Madhya Pradesh state in west-central India. It is the administrative headquarters of Shajapur District. Shajapur was recognised at the time of Shahjahan. Observing the natural beuty of this area , Fauj of Shahjahan decided to take a halt here . This place was known as ” Khankarakhedi ” . Shahjahan and his fauj liked this place very much and consequently when Shahjahan became SAMRAT he considered the importance of this place for his Southern campaign. In 1640 Meer Bigo was appointed here as Koutwal . He with Shri jagannath Rawal prepared four DWARs in four directions . In centre a marketing centre was developed . Consequently this area was populated gradually and converted in colony. Surrounding this place a wall was also prepared. Then in respect of king Shahjahan it was named as ” Shahjahanpur”. In Shahajahanpur twelve areas were located named Magriya, Mahupura, Dansi, Muradpura, Vajeerpura, Kamreedpura, Lalpura, Dayra, Mugalpura, Golyakhedi, Juganbadi meerkala. Muradpura was named after Shahjahan’s son and Muradpura and Meerkala were named after Meer Bigo himself . It is said that Chadralekha river ( which is now Chiller) was flowing in North direction before but after establishment of huge fort and for its safety it was brought from East as a PARIKHA of the fort . So at the time of Shahjahan (1628-1658) Jama Maszid, so many temples etc. were developed. He was very satisfied with developments and he honored Shri Jagannath Rawal by giving Jageer of Moja magariya. But at the time of Aurangjeb (1656-1707) , this area was totally ignored . After downfall of moughal dynasty , Shahjahanpur was brought in the Scindia state in 1732 and so many administrative changes were performed. The name “Shahjahanpur” was now ” Shajapur” in this period only. A beautiful palace in the fort was also developed by Tarabai. In 1904 it was declared as a district. JAMA MASJID JAMA MASJID is located on the bank of the river chiller. This masjid is construted by the HAIDER ALI TEG. This masjid is near the BADSHAHI BRIDGE. Hussain Tekri The shrine of Hussain Tekri was built by the Nawab of Jaora, Mohammad Iftikhar Ali Khan Bahadur, in the 19th century. It is situated on the outskirts of Jaora town in the Ratlam district of Malwa region of Madhya Pradesh. Mohammad Iftikhar Ali Khan Bahadur was buried in the same graveyard where Hussain Tekri was buried. During the month of Moharram, thousands of people from all over the world visit the shrine of Hazrat Imam Hussain here, which is a true replica of the one in Iraq. The place is famous for the rituals called Hajri to cure the incurable mental sicknesses. Maharaja moti Singh ji was a Rajput king form rajgad which comes in Madhya pradesh, India, it is approx 130 kilometer from Bhopal. he sat on the seat of the kingdom in 1873 at that time he was very young. He was a firm believer of Hinduism and use to hate Muslims a lot. He had given strict orders to the muslim people not to come before him before 12 noon, if he saw any muslim then he use to punish him the whole day and use to take bath and due rituals to purify himself as he has seen muslim before 12 noon which was very bad for him. One day early morning raja sahib went for hunting a poor muslim guy went for the nature call in the jungle after that he went to make wazu and was going for fajar namaz in a near by masjid, raja sahib saw him and asked him who he was he said I am a muslim and I am going for namaz as soon as raja sahib came to now that he was muslim he became angry and the guards of the raja sahib started beating the muslim man very badly. The man was beaten so much that he fainted and fell on the ground. When the family member of the muslim guy came to know about the incident they came and took the poor guy home all the family members on seeing the condition of the poor muslim guy they started crying and started cursing the raja sahib. Few days later the poor Muslim guy left his place and went to some other village. After raja sahib did this shame full act he came back to his mahal, due to the curse of the poor man family Allah tala got angry and sent his azab on raja sahib. A very unusual disease affected him. He use to face continues attack as if large no of scorpion are biting him he use to cry loudly in pain and when the pain was unbearable he tried to commit suicide. The family members were very much trouble and disturb they showed raja sahib to mostly all the hakim, vaid, doctors, pandit, sadhu, sant but none of them were able to cure the disease all the people were surprised and were not able to find out what the disease was. One day a close servant told raja sahib that we have tried all the things but were unable to cure your illness. There is a Sufi Muslim fakir who stays near the river of the jungle. He prays day and night, not bothered about any thing, if some one gave him any thing to eat then he takes it other wise he never ask any thing from any one. I have heard that he has shown many miracles if he will pray for u then I think that u will surely get cured. On hearing this raja sahib told his servant that u don’t know that my whole life I had hated muslim people and know u are telling me to go to him, the servant replied its ur wish raja sahib. He paused for a few minutes and said that we can try this fakir if baghwan(god) want me to get cured in this way then what I can do. They both went to the jungle early morning. The servant first went to the kamil fakir(who after wards was famous by the name of pyare shah sahib) and told him folding his hand that the raja sahib came here to see u and want to greet u on hearing this Pyare shah sahib(rehmatullah alaih) smiled and said how come your raja came so early as he use to not see the face of muslim before 12 noon. On hearing this the servant went to raja sahib and told him about the incident the raja sahib was shocked to hear this and said I think that he is a kamil fakir and ran towards the hut of pyare shah sahab(rehmatullah alaih) and while folding his hand said data sahab “fakiron ko gussa nahi karna chaye” means that the fakirs should not get angry. I am sorry what ever sins and mistakes I have committed plz forgive me for that, pyare shah sahab(rehmatullah alaih) replied in a loud wise oh u fool u have committed sins ask forgiveness for ur sins in front of Allah not in front of me, you have make Allah angry by troubling his servant, ask forgiveness from him not from me on hearing this raja sahab started crying and said I ask forgiveness from Allah but through your bless feet please pray for me. By now the anger of pyare shah sahab(rehmatullah alaih) also decreased. He prayed for raja sahab and said that now go inshallah u will be fine and from that day raja sahab got cured and was fine this incident had a great impact on raja sahab he started loving the muslim people and use to love pyare shah sahab(rehmatullah alaih) a lot. Raja sahab now made a habit of visiting pyare shah sahab(rehmatullah alaih) daily. He use to visit him early morning ad use to sit with pyare shah sahab(rehmatullah alaih) till 9 am and use to learn from him. His family members use to tell him not to go to the river so early as he could get cold and would fall ill. Raja sahab replied for 20 years I was falling the rule that I will not see the face of muslim man till 12 noon, now I want that for next 20 years there should be no one in front of me except muslim people. This thing went on for 5years and 9 months and one day came for which pyare shah sahab(rehmatullah alaih) was send here to rajgad. As regular schedule raja sahab came to meet pyare shah sahab(rehmatullah alaih) in the morning but was leaving the place before time. Pyare shah sahab(rehmatullah alaih) asked raja sahab what is the matter why are u going so early raja sahab folding his hand replied today I have not done my pooja path and dhyan I will go and do it now. Pyare shah sahab(rehmatullah alaih) smiled and asked “kiski pooja karte ho tum”? Means (whom do u pray) raja sahab replied krishna bhagwan ki, okay said pyare shah sahab(rehmatullah alaih) “kabhi darshan bhi huy hai krishana bagwan ke ya bus mandir main aise hi ghanta bajate rehty ho” means have u ever seen him or you are just shaking the mandir bells. Raja sahab replied how could a sinner like me see him I just see his photo and murti and pray. On hearing this reply all of a sudden the kaifiyat(state) of pyare shah sahab(rehmatullah alaih) changed he replied “ary ja tu bhi yun hi hai” means you are like this only, and told raja sahab to close his eyes. Raja sahab closed his eyes and was in this manner for 2 mins when he opened his eyes he felt on the feet of pyare shah sahab(rehmatullah alaih) and started crying and was saying “bus sabko dekh liya” means I have seen everything..
Pyare shah sahab(rehmatullah alaih) place his hand on the head of raja sahab and told him to get up and asked him what is the matter what have he seen that you are is loosing your senses. Raja sahab replied baba I have seen shri krishna maharaj he was playing basuri(flute), he stopped playing basuri and told me that “bawle ye to arabi awatar mohammed arabi(sal-lal-laho-tala-alaihi-wasalm) ka daur hai bus unka pallu pakde rakhna to akhirat main nijat hai, means this is the time of the holy prophet mohammed( sal-lal-laho-tala-alaihi-wasalm follow him and u will be saved and started playing the basuri there was voice of kalma tayeba coming from the basuri(flute) subhanallah. I am now reading the kalma that I heard from the basuri you take my hand in your hand and let me inform to the people of rajgad that I have become a muslim. Raja sahab also said that Krishna maharaj called me with the name abdul waseh khan. Pyare shah sahab(rehmatullah alaih) told raja sahab okay then from today I will also call you with the same name. I will not do any work hiding with others today only I will make sure the whole rajgad comes to know that I have become a muslim. As this news spread in rajgad and the near by area people were shocked to hear this news all of them rushed to raja sahab and told him that this is wrong and this should not be done muslim are cruel people and they have spread Islam with sword and many bad thing about Islam on hearing this raja sahab this is not true I was following the same religion and same thought as you people are now but none of the muslim came to me with a sword. I converted because I came to know that this is a true religion and the religion of peace. Anti Muslims have misguided many people with the false picture of Islam. After trying all the things people came to now that raja sahab wont leave Islam and use tell that fakir is a magician and has done some magic on raja sahab, the wife and the relatives of raja sahab left him, his room was shifted to a poor building none of the servant were allowed to make his food or do his work .raja sahab use to cook and do his work with his own hand but was not ready to convert back. the head of the raja sahab family decided that if we will tell raja sahab to convert back to Hinduism or he would have to leave his kingdom and in of losing his kingdom he will convert back. When raja sahab came to know about this he said “ye wo nasha nahi jise kursi utar de, agar tum log mere boti boti karke bhi chil aur kawon ko khila do to mujhe manzoor hai magar mujhe jo anmol khazana mila hai use chodne ko tayar nahi hun”. When the members of the raja sahab family tried everything and failed the made the complain of raja sahab to the British government the matter reached London to the head of British government. When raja sahab came to know about this incident he became very disturbed and went to pyare shah sahab(rehmatullah alaih). He (rehmatullah alaih) replied my son one get’s a diaomond after lot of strugle, u have to strive a lot and bare lot of pain. “tum ko soch samajh kar yahn ana chaye tha” means you would have think twice before coming here. Nothing has been wasted yet go back to your people. Raja sahab replied I am not worried about my status or my kingdom. I love staying in a hut just next to you. I am disturbed that if I lose this case my family members will be very happy and would make fun of my religion. Hazrat pyare shah sahab(rehmatullah alaih) on hearing this replied okay go and just start reading durood sahrif as much as you can. Raja sahab wrote the darood sahrif in Hindi and started reading that after few months the decision came in favor of raja sahab. The British government ordered that the kingdom has nothing to do with the religion raja sahab can continue with his kingdom and would be addressed with his new muslim name nawab abdul wase khan. The whole family of raja sahab on hearing the decision of the British govt was disappointed. Nawab sahab started ruling the kingdom he also hired Islamic scholars to teach him how read quran, pray namaz, read Urdu and learned all about Islam. He made two masjid in his mahal where he use to offer namaz and one big jama masjid inside a garden. Raja sahab use to love his religion a lot because he became Muslim after lot of strugle and sacrifice. Secondly his pir hazrat pyare shah sahab(rehmatullah alaih) blessed him so much that he became a kamil fakir , raja sahab use to spend most of the time in ibadat and riyazat many darwish and alim use to come to meet hazrat abdul wase khan(rehmatullah alaih) raja sahab and use to get blessed by his spirituality. Hazrat Haji Hafiz Shah Syed Qurban Ali Shah Badakhshani Al-Maroof Baba Badakhshani R.A was a born Wali Allah. He Was Born in Badakshan (Afganistan). He was Born In 1245 Hijri. He is a Hassani Sayed From His Father Side And Hussaini Sayed from his mother side. His father was a Horse trader. He originated from Makkah Sharif but later got setelled in Badakshan. When Hazrat BADAKHSHANI baba (rehmatullah alaih) was 11 years old he competed his uloom-e-zahaeri studies and was now in serach for a kamil pir who would teach his ilme tasawuf and how to walk on rahe sulook. Hazrat BADAKHSHANI baba (rehmatullah alaih) went to for a business trip with his uncle to arab and after the trip got over he wnet for Haj and then to Madina Shairf Hazrat BADAKHSHANI baba (rehmatullah alaih) stayed there for 7 years . One day Hazrat BADAKHSHANI baba (rehmatullah alaih) saw our Holy Prophet(sal-lal-laho-tala-alahi-wasalm) in dream our Holy Prophet(sal-lal-laho-tala-alahi-wasalm) said to Hazrat BADAKHSHANI baba (rehmatullah alaih) go towards India and showed him the picture of Bareli Sharif the place where his Pir-O-Musrhid Hazrat Niyaz Ahmed Sahab (rehmatullah alaih)was. When Ever his Pir sahab use to go out for fresh air on his horse Hazrat BADAKHSHANI Baba (rehmatullah alaih) use to run with the horse of his Pir Sahab with the Hookah in his hand many times he use to get hit by the stick which his Pir Sahab Use to Hit the horse he had shown the marks of the stick to some of his special mureeds. SubhanAllah what firm beliver Hazrat BADAKHSHANI (rehmatullah alaih) was of his Pir Sahab even by getting hit by the stick his love did not decrease for his Pir. His Pir Sahab use to do this purposely to test him . He got the khilafat in 1287 Hijri. He was then ordered to go back to his village by his Murshid. On his way back home Hazrat BADAKHSHANI (rehmatullah alaih) went hor Haj again and from there Hazrat BADAKHSHANI (rehmatullah alaih) went to Madina Shairf Our Holy Prophet(sal-lal-laho-tala-alaihi-wasalm) Ordered him to go back to India and spread din-e-islam there. Hazrat BADAKHSHANI (rehmatullah alaih) reached Bhopal in 1297 traveling through Lucknow and Bareli Sharif on his way he had made many mureed and shown many miracels. On reaching Bhopla Hazrat BADAKHSHANI (rehmatullah alaih) use to stay at the house of Abdul Latef Khan who was a lover of Auliya Allah. Hazrat BADAKHSHANI (rehmatullah alaih) use to offer his Morning, Magrib and Isha namaz in the jungle after the namaz-e-ishraq Hazrat BADAKHSHANI (rehmatullah alaih) use to meet his mureed and use to teach them about tasawuf and other related topics after the dars every one use to have tea and breakfast . One Day the daughter of Abdul Latif Sahab who was ill from many days died in the morning when Hazrat BADAKHSHANI (rehmatullah alaih) came back from Jungle as he use to do every day after namaz-e-ishraq. Abdul Latif Sahab did not tell Hazrat BADAKHSHANI (rehmatullah alaih) about this incident and gave him tea Hazrat BADAKHSHANI (rehmatullah alaih) asked him your daughter has not come to meet me from many days call her I will give her tea. Abdul Latif Sahab replied Hazrat (rehmatullah alaih) she is not well she is very ill you plz drink the tea. Hazrat BADAKHSHANI (rehmatullah alaih) replied I will make dua and do dum on her call her after hearing this Abdul Latif Sahab told Hazrat BADAKHSHANI (rehmatullah alaih) that she had died just now I have not told you only because you will not have then. On heraing this Hazrat BADAKHSHANI (rehmatullah alaih) baba got very angry and said there is a dead body lying in the house and you are giving me tea bring her to me. This thing continued for half hour after that the child came back to life she said water water. Hazrat BADAKHSHANI (rehmatullah alaih)gave back the child to his father and said what were you saying that she is dead her air pipe was blocked. Hazrat BADAKHSHANI (rehmatullah alaih) took the veil from this world on 20th Ramzan 1334 Hijri at that time his age was 70 years. Hazrat BADAKHSHANI (rehmatullah alaih) got the khilafat when he was 30years of age he got the khilafat from silsila-e-qadariya and chistiya. Since then his anniversary is celebrated as “URS” in the month of March from 10-12. People of all communities from all over the India and some of other countries come in to the URS for spiritual gain. His Mazar Shairf is Rajgarh, Madhya Pradesh. It is 145 km from Bhopal. I have taken the whole matter from the book Lal-E-BadakShan Urf Sawane Qurban Ali(rehmatullah alaih) this book is written in urdu by Sayed Sarfaraz Ali and was transleted in hindi by Abid Ali Mansoori. I did th english translation may Allah forgive me if I have done any mistake while translation (amin). My Murshid Hazrat Mohammed Fazal Hussain Shah Madari,Qadri ,Chisty Urf Pir Yazdani whose mazar sahrif is in Khilcipur his father was the mureed of Hazrat Badakshani Baba (rehmatullah alaih) and was also offered Khilafat but he refused to accept it for some reasons. When my murshid was very young his father took him to his Pir Hazrat Badakshani Baba(rehmatullah alaih) as his child would die as they were born. Hazrat Prayed for the young child and told his father that your child would be a saint and will bless many people with his roohaniyat and you would not get any worldy pleasure from him. Mastani Amma was a great Waliya she was a mast(absorbed in the love of Allah) she use sit with a matki(vessel made up of mud) on a choola(gas) and use to put what ever given to her in that matki once a pigeon came flying to her she put that alive pigeon in that hot matki after some time the owner of the pigeon came and asked her whether she had seen her pigeon on hearing this she replied oh that was your pigeon i am so sorry she put her hand in that hot matki and removed the pigeon the pigeon was still alive. My murshid Hazrat Fazal Hussain Shah Madari, Qadri, Chisty urf Pir Yezdani had eaten 3 spoons of khichdi from her hands. state of Rajasthan, and the districts of Shajapur, Sehore, and Bhopal. It forms the north western part of Bhopal Commissioner’s Division. respectively. The zigzag boundaries of the District resemble a pear. NH-3 and Railway Network. Major tourist attraction is Narsinghgarh. Newaj and Parbati Rivers flows through the district. population. It is 145 KMs from the state capital Bhopal.